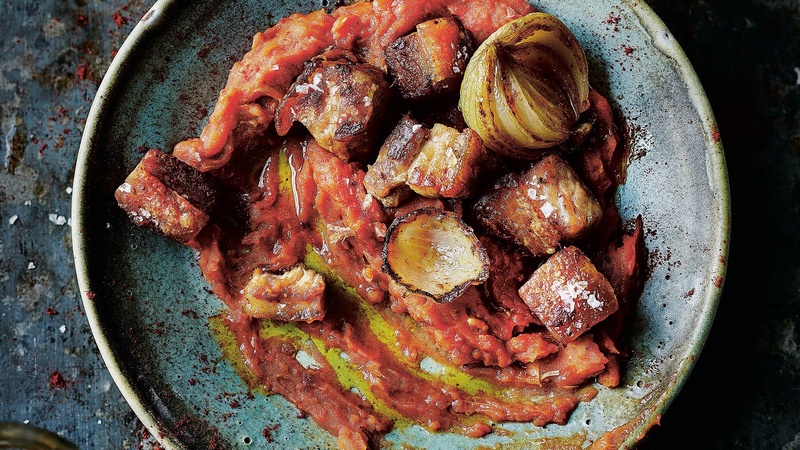 Crisp, salty pork crackling with creamy, spicy mash: this simple tapa is a sure-fire winner. It hails from Avila in the province of Castilla, the epicentre of Spain. Castilla is a land of history, kingdoms, castles, cathedrals and an outstanding gastronomy. Serves four as a tapa. Put the potatoes, garlic, onion, a pinch of salt and the bay leaf in a pan and cover with water. Bring to the boil and cook over a medium heat for about 25 minutes, until the potatoes are soft. Drain the potatoes, but keep a bit of the water, the garlic, onion and bay leaf. Peel the garlic and keep the pulp. Heat a drizzle of oil in a frying pan and fry the pork belly pieces with the bay leaf from the potatoes and a bit of salt until crispy (this can take up to 30 minutes). Set the meat aside to rest. In the same pan, fry the half-boiled onion, then set aside for later. Fry the garlic until light golden. Add the sweet and hot pimenton and after 10 seconds add the potatoes, give them a stir and mash them in the pan with a fork. If they get too dry use the reserved cooking water to thin the puree. Season with salt and pepper. Serve the potatoes with the crispy pork belly and pan-fried onion on top.